I went to my grandma's home in Terengganu during last Eid al-Adha and since it's in a rural area so there's no mobile line at all. I usually bring along a book or novel to read to kill time and this time I brought Arkitek Jalanan by Teme Abdullah with me. It's been ages since I last read Malay books. Wait, no. It's been ages since I last read any books at all (still not finished reading The Kill Order, haha) so reading Arkitek Jalanan had been a pleasure during that so-boring-no-internet period. 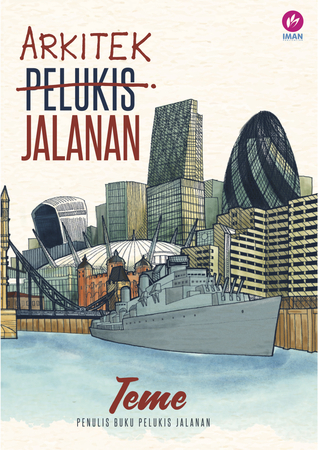 I've read the first book, Pelukis Jalanan, about two or three months before I purchased Arkitek Jalanan. Since I didn't post a review on Pelukis Jalanan before so I think why not just compile both books in one review post because both told quite the same storyline so here it is. Both books told the story of life journey of Teme, the author himself. 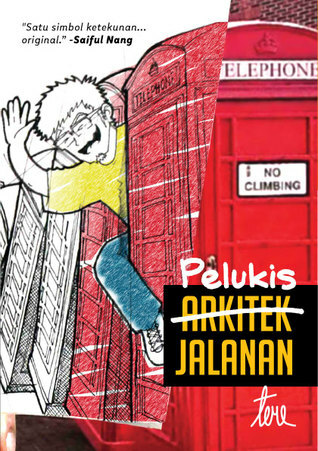 In Pelukis Jalanan, Teme wrote about his younger self who was ignorant of continuing his study for a brief moment so he failed to secure his sponsor for A-Level and how he overcomes that matter to continue his study in UK. In Arkitek Jalanan, Teme wrote about his challenges and struggle to finish his degree in UK and more about his friendship with Ahmad, his best friend. To be honest, I bought these books because I knew Teme from his drawings in Instagram and because he's an architecture student. I wanted to satisfy my curiosity about Teme's architectural journey, whether he has the same thoughts or not and how he got the offer to continue his study in UK and finally was employed at an architectural firm there. I personally love how realistic Teme portrayed his life as a student who struggles both in studying and financially in order to finish his degree while his friendship with Ahmad made me feel really thankful to my own close friends. I also love the bonus part in Pelukis Jalanan where Teme compiled his sketches with motivational captions. However, I don't really like how Teme wrote the books using third person point of view considering that he actually was writing about himself. I prefer to read bombastic sentences rather than a simple one and Teme's style of writing was the simple one which didn't catch my interest to keep reading. It took me about three to four days to finish reading one book while others could finish it by only three hours. The storyline was written well and both books were so full of inspiring incidents and quotes which made them a must read book especially for you who are going to continue your study in higher level or if you are on the verge of giving up with your study. These books definitely would be a motivation for you. My friends are obsessed with his books! I might buy one if I get a chance to hit a bookstore soon! ohhh kau balik terengganu eh raya baru ni? Hahahaaa. To be honest, I've heard of his name but not what he's up to.. Maybe I could grab one of his book and give it a try..